With regret, we inform you about the passing away of our beloved Nambiar Amma, at age 97, early this morning, Friday November 3rd, 2018. Smt. 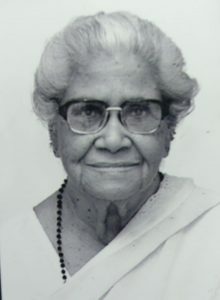 Leela Nambiar, a pillar of the Mission, was a founder Trustee of Central Chinmaya Mission Trust. A key figure in all Mission activities, Nambiar Amma helped establish the education movement of Chinmaya Mission, that initially put down roots in Chennai. She was Honorary Treasurer for the Chinmaya Vidyalayas, Chennai for many decades. Nambiar Amma was the publisher of Tapovan Prasad, the international magazine of Chinmaya Mission, for the last fifty years. Periodically she also took on the responsibility of the editor and nurtured the magazine through the years. Sarveshwara Dhyana Nilayam in Thamaraipakkam, near Chennai, took shape under her careful guidance. Her house was the hub of many mission activities in the seventies and eighties. Most importantly, she was one of the most dedicated devotees of Pujya Gurudev, Swami Chinmayananada. She served and hosted him in Guru Niketan, her family home, Chennai, from 1963-1993. Her unwavering faith and surrender to God and Guru, with a Serve All Attitude, has made her unforgettable. She will be greatly missed. With her passing away, a whole era of Chinmaya Mission seems to have receded into the past. We offer prayers for her peaceful passing to the Lord and for granting strength to the family, in this hour of loss. May she ever remain in His loving grace and care. Our respectful Shraddhanjali to Amma.